In the Amarr tongue, their name is Imud Hubrau, or "Beast of Heaven." To the Gallente, they are known as Soltueurs, or "Sun Slayers." The collective name for these behemoths is Titans, the largest spacefaring vessels ever constructed. The sheer cost in resources, manpower and time, as well as the necessary technological knowledge, makes construction of a Titan-class vessel a venture only empires can usually fathom. Some of these mammoth vessels have taken decades to assemble. Many are over a century old themselves (the three mammoth Jovian motherships, the first ships built on the scale of titans, have origins pre-dating modern space travel). They are maintained with constant upgrades, and at any given time, one of the three is out of commission while undergoing retrofits. Their value is indescribable. Functioning for those who own them as a mobile base of operations as well as a flagship, Titans turn the tides of war with their mere presence. 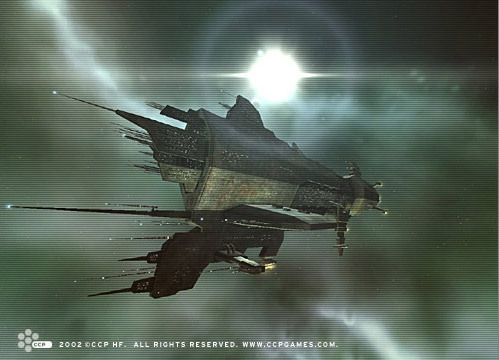 Aside from their blistering armament and many-metres-thick armour, they boast the ability to transport entire fleets within their hulks across entire star systems. Their mind-boggling mass can cause small ships to become trapped in the gravity bow-wave before them. A few of these vessels are massive enough that their presence affects planetary tidal patterns. One notable incident occurred on the small agricultural world of Goral, where a Gallente Titan moving into orbit caused an abrupt shift in tides, which flooded crop fields and farmland. The decrease in food production meant that the entire system, which depended on Goral for food stock, had to be supplied by merchants or face starvation. Since then, Titan navigation systems have been programmed with fail-safes to prevent them from approaching a planet so closely. The construction of a Titan has, in recent years, become an option available to more than just the richest of empires. With the advent of exploration, new resource-rich worlds have been discovered. For the construction of an Amarr corporation’s newest fleet addition, a lush, tropical moon was decided as a prime source for resource extraction. After decades of aggressive strip-mining, the moon's surface had been mostly torn away. At the cost of tens of thousands of Minmatar slave lives, the Titan was complete, leaving the moon a devastated, tectonically unstable hell.